Rod Gilmour collaborated on a new book by world No 1 James Willstrop. Here, he reveals how the book came to fruition. The plan was simple. Approach Yorkshireman James Willstrop, the current world No 1, and get the inside story on a year in the life of a touring pro. Publish book. This was going to be no easy task: publishers were wary of squash's value in the commercial marketplace, especially in an Olympic year. (What, squash isn't an Olympic sport?). However, I knew there was a story to tell with James. And since he ended up writing it himself - shunning my original intention of ghosting it - I can vouch for the finished product, one where a sportsman has left few secrets in the locker. You won't find any 'we scraped a 1-1 draw, then went for a meal with the Mrs' here. These are Willstrop's own words and it was, at times, an intoxicating project to work on considering he was opening up on some deeply personal issues. We did receive offers from less-well-known publishers but declined - the returns would have been far less and we knew the market, where to push the boat. Promotion was also going to be hard graft without the help of a publisher's in-house PR machine whirring away, so opting for the self-publishing route was always going to leave us with a job on our hands. We weren't the only ones in this predicament. Contributors to the Sports Journalists' Association website have written extensively on the plight of getting published in the saturated sports' book market. More and more have turned to self-publishing, and with considerable success too. Be bullish, web savvy and know your market seems to be the mantra. For us, the rewards have been significant. From sorting image plates and sourcing the ISBN number, to 3,500 books briefly landing in my living room, it has been a cathartic process in learning how a book is put together. Even more so when a literary agent friend said she didn't have the first clue in how to sort ISBN's and barcodes. If all else fails, at least we know that the book will sell in Yorkshire. After all, the county does have the world's top two players in Willstrop, 28, and 31-year-old Nick Matthew, Britain's double world champion. Cue all those plentiful Yorkshire literary festivals. Therein lies one of the themes: a superb insight into the healthy - and barely written about - rivalry between these two Britons. Two athletes who really should be competing at the London Olympics. Two athletes who have slugged it out twice in recent years in matches lasting well over two hours. Forget five-hour tennis epics, these were jaw-dropping, physically bruising encounters. I was the only newspaper journalist at both. In between his on-court experiences, Willstrop charts a gruelling life on the road: proving the naysayers wrong that he couldn't compete at the top level on a vegetarian diet; detailing life without his mother (who died of cancer in 2000); the weird and wonderful life at Pontefract Squash Club being coached by his eccentric father, Malcolm, and the constant doubt over injuries. Or 'doubt, doubt, doubt' as he writes more than once. There was concern that he might be giving away too much considering he has five or so years left in the game; also that readers might lose interest in too much off-court detail. But here's the crux of the book: playing within four walls, or 360° glass on the world tour, is an incredibly tough existence mentally. And for those who follow the game, the Yorkshireman explores the claustrophobic nature of his sport brilliantly, and how it affects him. The book will appeal to squash enthusiasts first and foremost. Matthew, and less so Willstrop, are not household names yet - although with 500,000 playing squash regularly in the UK someone must be doing something wrong. Profiles are what the sport is crying out for, but the wider public needs to be re-educated on squash first after its media heady days in the Eighties. This is a fine starting point. 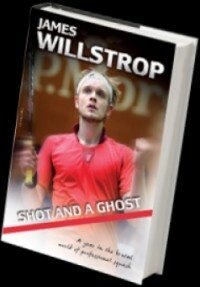 A Shot and a Ghost: a year in the brutal world of professional squash' is available from www.willstrop.co.uk, (£9.99) and Amazon or Kindle.